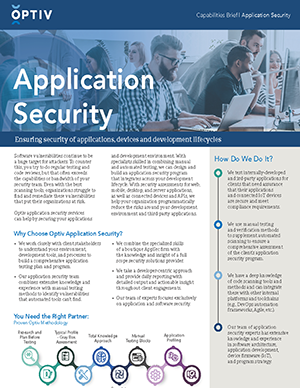 Optiv AppSec services reduce security risks around your software development environment and lifecycle processes. With an experienced team of specialists skilled in performing manual code reviews along with automated testing methods, we can help you design and build a mature application security program that integrates with your specific development lifecycle. With security assessments for web, mobile, desktop, server, and connected-device applications, as well as security testing for application APIs, we help your organization programmatically reduce the risks around your development environment and third-party applications.